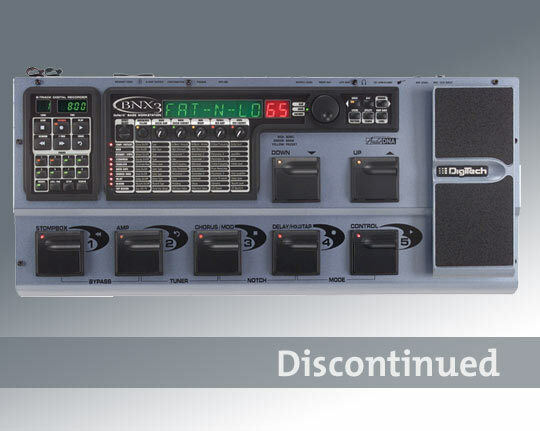 By combining the world's most powerful multi-modeling bass guitar processor with a digital 8-track recorder, the BNX3 gives you everything you need to perform, practice, write and produce songs in a single unit. The BNX3 bass workstation is the first multi-track recorder that works like a bass player thinks. Experience the first hand's-free multi-track recorder that lets you focus on creating and recording music instead of messing with mixers, cables and patch bays. Record, playback, auto-arm the next track, or delete tracks, all without touching a knob. Save tunes on SmartMedia™ and easily import your tracks to a PC or Mac. Polish them with Cakewalk® Guitar Tracks™ and burn a CD with Pyro™ (both included). Convert CD, .MP3, .WMA files -- virtually anything that's out there -- to .WAV files and move them into the BNX3 to jam along with. because you have the perfect songwriting sketch pad at your feet all the time. Start with a drum track, lay down a rhythm track and then a bass solo -- all without taking your hands off the bass! Want to add a vocal? No problem. The BNX3 offers a balanced XLR input for capturing vocal and acoustic performances too. or as part of a studio production, you've never had a more powerful creative tool at your feet. Dimensions Length 20.75" Width 9" Height 3"
How do I do a hard reset on my BNX3? You can reset the BNX3 by pressing and holding in the Drums button, (the one by the data wheel, not the one on the recorder) as you turn on the power. When the display shows "RESET", let go of the drums button and press the MODE button. When the display shows "TOE DOWN" move the expression pedal all the way forward and press the #3 footswitch. The display should then show "TOE UP". Move the pedal all the way back towards you and press the #4 footswitch. The display should then show "VSWITCH". Move the pedal forward and put some pressure on it until you see the numerical display change numbers, then back the pedal off again. It is now reset.